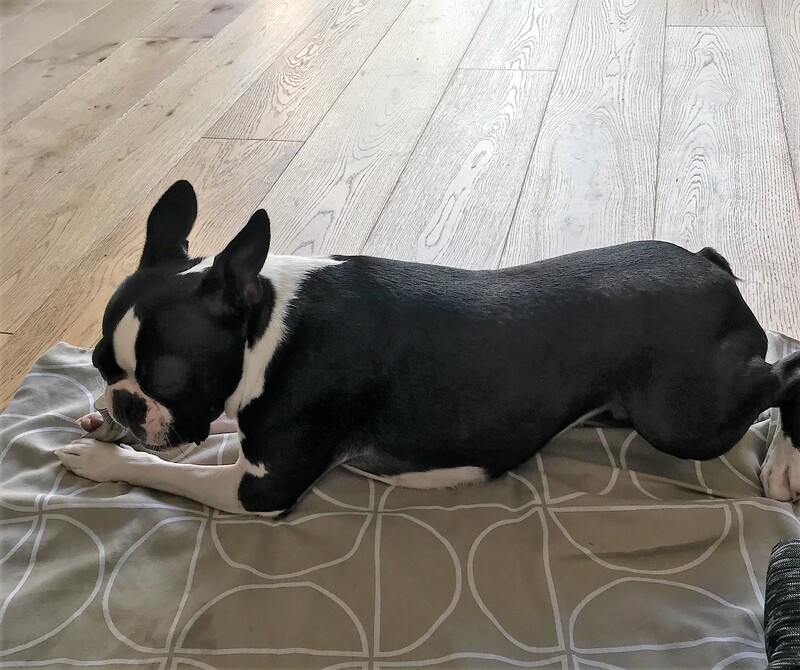 Henry is a 2 and a half year old Boston Terrier who developed an occasional limp from his front legs. His Mum asked if we could come round and assess and treat. Chris helped to ease out some of the tension in his back muscles and also worked with Henry’s tight shoulder. In the meantime, Henry had brought Chris all his toys to share and gave him kisses – which he apparently only ever does to his Mum. Ooops – happens all the time to us. Chris noticed the lovely wooden floor in his house. The things we do and suggest come about from our own experiences. We know hands-on therapy can help to change a dog’s life…our Sarah has proven that and is our inspiration to share that with as many other dogs as possible. Flooring is another. When we moved in to our current house the carpets were probably the original carpets to when the house was built – 1949! So we put down shiny lush bamboo. It was environmental, ethical and lovely. But our house has loads of circular routes. The dogs used the floors as racetracks. The grooves that we now have in the wood confirm that. But that meant they slipped in their enjoyment. We started with a few scattered mats – but they slipped too despite anti-slip tape. We went to bigger rugs. But they had areas between which were still lethal to wobbly dog legs. Last year we bit the bullet. We went to a local carpet store and bought a large offcut. Armed with our precise measurements, the store cut several bits for us which made a joining jigsaw of offcut carpets. They even bound all the edges. For less than a couple of hundred £ we had carpeted all downstairs. No more slipping from our dogs or visitors to the therapy room. Cartoon leg spinning might make people smile on YouTube videos (not me, by the way, they make me Grrrr). Think about how you feel when you slip on a wet floor. That suddenly becomes not funny. When Henry was outside on a flat surface, it was clear his back was straight. But when he was on the wooden floor you could see his back was hunched slightly. His mind was probably thinking “OK…I can usually negotiate this floor but with my funny leg it’s rather awkward now”. The simplest solution was to lay down Yoga Mat Islands for him. They’re ideal as a runway when he’s rushing about and can be taken up when he’s chilling. Hopefully, they can help speed up his healing. Many people who follow our suggestion find their dog quickly gets used to the idea and then they find them looking for it if it’s been forgotten to be put down. Offering advice and suggestions on simple, practical, cheap, yet effective household adaptations has always been part of the overall service we give during a therapy session. This entry was posted in acheypaw, achy paws, AchyPaw, achypaw myotherapy, Brighton Dog Massage, canine myotherapy, canine myotherapy, dog myotherapy, achypaw myotherapy, myotherapy, achy paws, confidence boost, Dog, Dog massage, dog myotherapy, household adaptations, massage benefits, multimodal, multimodal therapy for dogs, not just arthritis, south coast dog massage, therapeutic massage and tagged acheypaw, achypaw, achypaw myotherapy, achypaws, Canine massage, canine myotherapy, Dog massage, dog muscle therapy, east sussex, household adaptations, injury prevention, prevention, south coast dog massage, therapeutic massage. Bookmark the permalink.